When we shop at Costco, we count by fives. There is no buying anything under $5. So when we have $25 for the week, we can buy roughly 5 items at most. That’s exactly what we did this week. We had company this week, so I plan much deal shopping – we just needed basics. This month, we are only spending $25 a week on groceries for our family of 5. We had a big grocery trip at the beginning of the month, picked up some bulk produce, and set aside $25 for any weekly purchases. This is part of our #CheapHealthyCostco Experiment. We are trying to eat as healthy as possible (mostly organic, real food) while sticking to a budget that our family would roughly receive on full SNAP (food stamp) benefits – $150/week. This feels really generous compared to our early days, but everyone is different, and we specifically wanted to see if we could eat a ton of organic, real food on a food stamp budget. That is everything we’re planning to buy this week. Simple food is great. Towards the end of the week, we have a farm pick-up. I will get some milk there, but I already set aside money for this pick-up that is separate from our weekly budget. Something else? I don’t know. I don’t like menu planning. Snag any good deals this week? Share in the comments below – better yet, drop a link if you shared it on Instagram, Facebook, or your own blog! 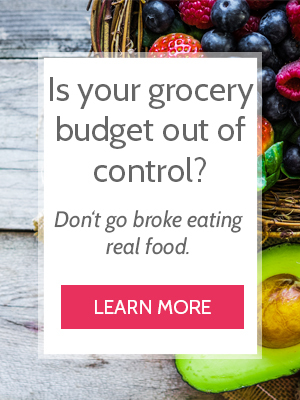 Want free frugal real food menu plans? Every month I send them to the Cheapskate Cooks. It’s free to join, and you get an invitation to our private Facebook Group. Learn more here!